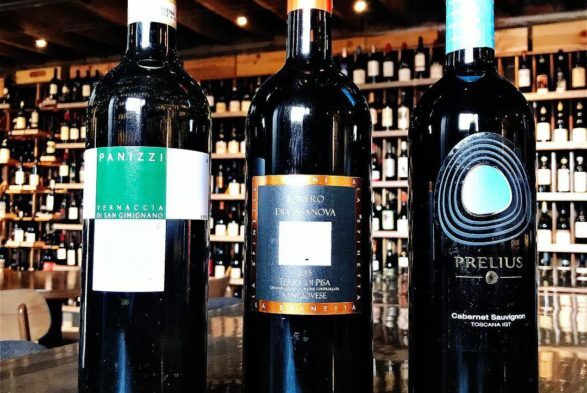 We are so excited about our upcoming wine pairing dinner next Tuesday, April 16th because this month we are featuring the beautiful wines and food of Tuscany. Ah, Tuscany, sweet, sweet Tuscany. If you haven’t been to Tuscany, fear not! This wine pairing dinner will let you taste your way through this rich and historied region. There are countless amazing wines from this area of the world and we are humbled to have the opportunity to share some carefully selected bottles with you. Even more exciting is what our wonderful Chef Kristen Barnett has created for the three courses of the tasting. Touching on the vibrancy of Tuscan delicacies, Chef Kristen has curated three courses that are a dynamic representation of Tuscany. Starting with a Ricotta and Shrimp Fritta, the 2016 vintage of Panizzi Vernaccia de San Gimignano is a delightful complement. This light, straw colored wine is full of green fruit like apple and pear with a touch of grapefruit and good acidity. After this introductory course, the second pairing is a Pork Tenderloin Cacciatore with the 2015 La Spinetta Sangiovese. The nuances of the 2015 La Spinetta Sangiovese are particularly highlighted with this dish. The wine is bold and has a strong structure making it an excellent food wine. Finally, the third course, a Coffee Rubbed Duck Breast Crostini is paired with the 2017 Prelius Cabernet Sauvignon. If you’re no stranger to our by-the-glass menu, this wine is a staff and patron favorite. With its blackberry, blueberry and cinnamon aromas, this full-bodied wine is complex and exciting. The combination of these notes with the coffee element of the duck breast is really inspiring. As usual, these wines can be purchased and taken home with you. Which means that you can explore creating pairing your own Tuscan-inspired dishes! We are already looking forward to hosting those of you who are attending this dinner next week. And, if you are interested in attending future pairing dinners, we have them every third Tuesday of the month. Please sign up to receive our emails so you don’t miss the next one. Because this event is definitely something not to miss!